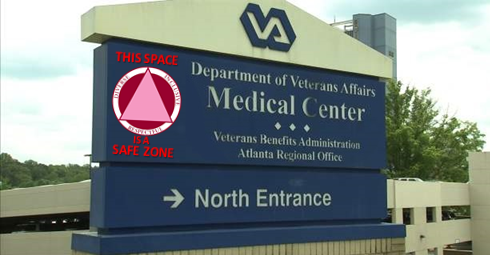 CAVEAT: The VA is doing great things for veterans and their families, despite its troubles, and the VA in NO WAY has a policy, nor is it preparing a policy that bans offensive speech. However, a well-intentioned group of social workers seem to be trying to change that. 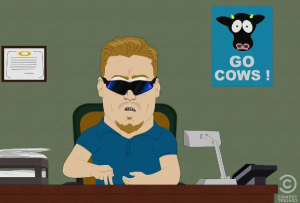 Thanks to comedians such as Jerry Seinfeld and Chris Rock poking fun at the absurdity of college Safe Spaces, and South Park’s mockery of the Political Correctness movement with their latest season’s “PC Principal” character, it seemed that the PC culture may have been slowly subsiding here in the United States. Does it make you an a**hole to say something that intentionally causes a person emotional distress? Sure. But that doesn’t mean it should be illegal to say hurtful things, nor does it mean that we should have policies changed simply on account of some hurt feelings. My parents taught me at a young age that if somebody else’s words made me feel a certain way, then it was because I chose to provide them that power over my own feelings. “Sticks and stones”, right? For example, if my boss tells me he’s impressed with my work, then it makes me happy. It makes me happy because I value his opinion, and I choose to let his comment affect my emotions. Suppose a stranger tells me that my haircut looks stupid. I am unaffected emotionally, because I don’t care what this individual thinks. (Although I may check a mirror later just to make sure he’s not right). 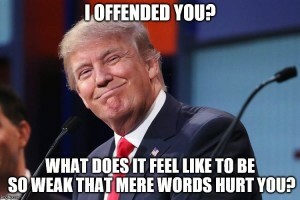 So the way I see it in most cases, people offended by words are choosing to give the “offender” power over them. to Trump, giving him the power to affect their emotions. And they’re actually feeding in to his success in the primaries. One of the greatest contributing factors to Donald Trump’s enduring popularity among conservatives and moderates alike has been his confidence to say things that are seen as Politically Incorrect. The counter-culture to the PC movement has been strong, and there’s a good chance most of us can’t go a whole day without seeing a meme such as this one on social media. One of the main reasons behind this, the social workers say, is because many veterans who had not served during times of war or who hadn’t deployed felt unworthy of the title. This, my friends, is why we use the term “veteran” to refer to any person who has served in the armed forces and “combat veteran” for individuals who have served in a theater of combat as defined by the U.S. Department of Veteran Affairs! It feels excessive? If you agree, then please comment below. I would really love to know how calling a veteran “veteran” is excessive. The word veteran is not currently, nor has it ever been, pejorative. Back in the Vietnam era, there were certainly vets – including members of my family – who chose not to identify themselves as vets due to the negative stigma at the time. But this is a different time. If there is a veteran in need who seems to be struggling with his or her identify, then maybe it’s best for the social worker to ask more questions and respect the patient’s boundaries, but this kind of policy change is completely absurd. Similar to the whole push to replace the term “illegal alien” with “undocumented immigrant”, this is a seemingly unnecessary endeavor that only serves to detract from the real issue at hand – which is access to quality veteran healthcare. I am a combat veteran and I approve this message.